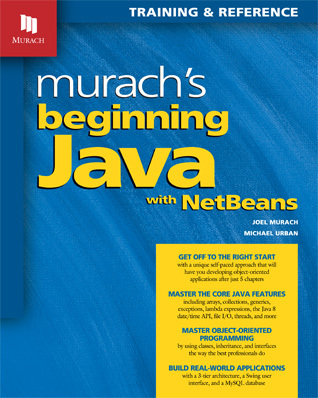 For years, Murach’s Java Programming has been one of our best-selling college books...but its fast pace can make it a challenging book for beginners. That’s why we designed Murach’s Beginning Java with NetBeans specifically for a first course in programming or a first course in Java. From the start, your students will be using the NetBeans IDE because that will help them learn faster. Then, by chapter 3, they’ll be developing applications that use classes from the Java API. By chapter 4, they’ll be creating and using their own classes. By chapter 5, they’ll be using a 3-tier architecture to structure object-oriented applications like a professional. And by chapter 6, they’ll be using the best practices for testing and debugging their applications. For this book, we’ve chosen the NetBeans IDE because it’s free, widely used, and easy for beginners to get started with. Then, chapter 1 shows the basics of using this IDE, and subsequent chapters present new NetBeans skills whenever they’re useful. Note, however, that we also have an Eclipse version of this book. So if you prefer to use that IDE, please get a review copy of that book. The only difference between the two books is the IDE. As you can tell from its title, this book shows how to use the NetBeans IDE to code, test, and debug applications. We chose NetBeans because we think it’s a great tool that is easy for beginners to use and runs on all operating systems. Your students can download Java and its documentation for free from the Oracle website. Likewise, they can download NetBeans for free from the NetBeans website. To make this easier, Appendix A (for Windows) and Appendix B (for the Mac) explain the procedures that they will use to download and install both pieces of software. Want to use Eclipse instead of NetBeans? If you prefer to use Eclipse for your Java course, please note that we have an Eclipse version of this book called Murach’s Beginning Java with Eclipse. The only difference between that book and this one is the IDE. It differs from this Beginning Java book in that (1) it goes into more depth and breadth on some subjects, especially GUI and database handling, and (2) it covers up through Java 9 instead of Java 8. It differs, too, from the 4th edition in that we integrated much of what we learned from the Beginning books to make this edition more beginner-friendly.